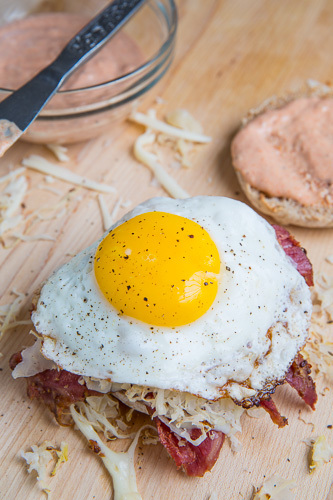 The classic Reuben sandwich with corned beef, swiss cheese, sauerkraut and tangy russian dressing served up in breakfast form in an english muffin with a fried egg. One of the best things about St Patrick’s Day has to be all of the leftover corned beef and although the reuben sandwich is my favourite way to enjoy those leftovers, it is sometimes difficult to wait until lunch to make a reuben sandwich! This year I thought that it would be nice to push it up a bit and have a reuben for breakfast in the form of a breakfast sandwich in an english muffin with a fried egg! 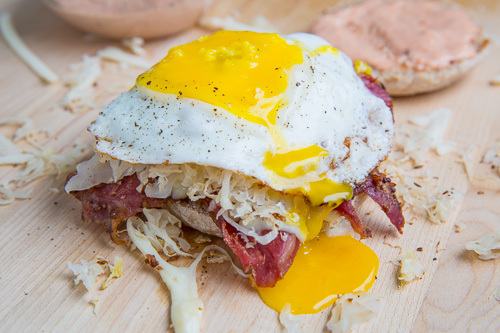 This breakfast reuben sandwich has all of the flavours of a regular reuben sandwich with the corned beef , swiss cheese, sauerkraut and russian or thousand island dressing but it is served in an english muffin with a fried egg. The only thing that is missing really is the lack of rye bread and if you feel up to it you could make your own rye english muffins but I took an easier route and simply added one of the primary flavours of a rye bread, the caraway seeds, to the breakfast sandwich. This sandwich certainly is one tasty breakfast treat and a perfect way to get a start to the day after St Patrick’s Day! Just look at that amazing runny egg yolk! 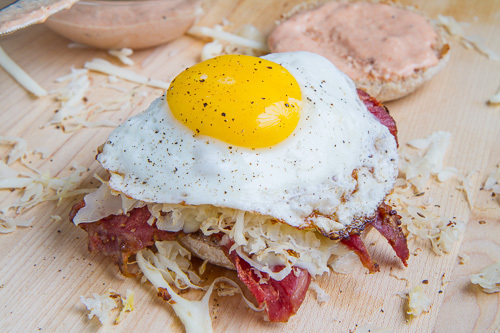 This breakfast reuben sandwich can be a bit messy but it is definitely worth it! Place the corned beef on one slice of muffin, top with the swiss and broil to melt the cheese, about 1-3 minutes. 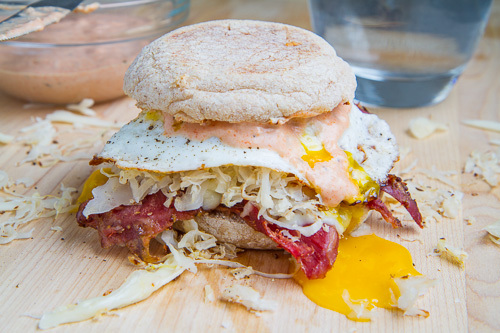 Top with sauerkraut, caraway seeds, dressing egg and muffin and enjoy! I have been craving a reuben lately, and you have just kicked it up a notch! Kevin, I've been eating my version of a Reuben all week: pumpernickel, canned corned beef (not the greatest, but it's just me! ), swiss cheese, sauerkraut, thousand island dressing, mustard. An egg would be a welcome addition. Oh Kevin, you've outdone yourself. What I won't do for a runny egg…love it. All of it. WANT. Now that is a breakfast sandwich! Wow! Yeah this all kinds of kills me. Breakfast Reubens are one of my favorite things! I made mine with pastrami but corned beef would be absolutely divine!! Good thing I still have some rye english muffins in my freezer!! What a looker! That sandwich is amazing! You always have the BEST creations!! Now this is a super fun breakfast ~ especially with that runny egg on top! Heeeeelllllooooo!!! amazing brreakfast sandwich. Just amazing! I LOVE eggs on sandwiches and this looks like the ultimate. Wow – I don't know what to say about this one! Absolutely stunning – photography is amazing and this makes me want to create and consume this myself! my fiance saw this as i pulled it up on the screen and he said "holy cow that looks AMAZING" and i'm ditto'ing what he said! This looks so good! I love runny eggs, and Reuben's are my favorite. I never thought of combining the two! Sheezus Kevin this ain't really helping my diet but it sure looks amazing!!! You always have the most amazing looking and sounding food!!! YOu should try making a Jewish style "salt beef" sandwhich on rye with English mustard. I'm sure you could find a way to make it more interesting but don't mix milk (cheese) with meat, thats against Jewish dietary laws. Also aim to do it before or after Passover. Try to do something for your Jewish/Muslim fans which doesn't involve food they can't eat ie: Pork or meat and cheese/cream together all the time. Thanks and keep up the great work!